This article is about the collection of airborne particulates. For the practice of smoking, see Smoking. For other uses, see Smoke (disambiguation). Smoke from a bee smoker, used in beekeeping. Smoke is an aerosol (or mist) of solid particles and liquid droplets that are close to the ideal range of sizes for Mie scattering of visible light. This effect has been likened to three-dimensional textured privacy glass — a smoke cloud does not obstruct an image, but thoroughly scrambles it. The composition of smoke depends on the nature of the burning fuel and the conditions of combustion. Fires with high availability of oxygen burn at a high temperature and with small amount of smoke produced; the particles are mostly composed of ash, or with large temperature differences, of condensed aerosol of water. High temperature also leads to production of nitrogen oxides. Sulfur content yields sulfur dioxide, or in case of incomplete combustion, hydrogen sulfide. Carbon and hydrogen are almost completely oxidized to carbon dioxide and water. Fires burning with lack of oxygen produce a significantly wider palette of compounds, many of them toxic. Partial oxidation of carbon produces carbon monoxide, nitrogen-containing materials can yield hydrogen cyanide, ammonia, and nitrogen oxides. Hydrogen gas can be produced instead of water. Content of halogens such as chlorine (e.g. in polyvinyl chloride or brominated flame retardants) may lead to production of e.g. hydrogen chloride, phosgene, dioxin, and chloromethane, bromomethane and other halocarbons. Hydrogen fluoride can be formed from fluorocarbons, whether fluoropolymers subjected to fire or halocarbon fire suppression agents. Phosphorus and antimony oxides and their reaction products can be formed from some fire retardant additives, increasing smoke toxicity and corrosivity. Pyrolysis of polychlorinated biphenyls (PCB), e.g. from burning older transformer oil, and to lower degree also of other chlorine-containing materials, can produce 2,3,7,8-tetrachlorodibenzodioxin, a potent carcinogen, and other polychlorinated dibenzodioxins. Pyrolysis of fluoropolymers, e.g. teflon, in presence of oxygen yields carbonyl fluoride (which hydrolyzes readily to HF and CO2); other compounds may be formed as well, e.g. carbon tetrafluoride, hexafluoropropylene, and highly toxic perfluoroisobutene (PFIB). Emission of soot in the fumes of a large diesel truck, without particle filters. Pyrolysis of burning material, especially incomplete combustion or smoldering without adequate oxygen supply, also results in production of a large amount of hydrocarbons, both aliphatic (methane, ethane, ethylene, acetylene) and aromatic (benzene and its derivates, polycyclic aromatic hydrocarbons; e.g. benzo[a]pyrene, studied as a carcinogen, or retene), terpenes. Heterocyclic compounds may be also present. Heavier hydrocarbons may condense as tar; smoke with significant tar content is yellow to brown. 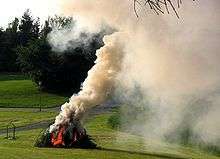 Presence of such smoke, soot, and/or brown oily deposits during a fire indicates a possible hazardous situation, as the atmosphere may be saturated with combustible pyrolysis products with concentration above the upper flammability limit, and sudden inrush of air can cause flashover or backdraft. Presence of sulfur can lead to formation of e.g. hydrogen sulfide, carbonyl sulfide, sulfur dioxide, carbon disulfide, and thiols; especially thiols tend to get adsorbed on surfaces and produce a lingering odor even long after the fire. Partial oxidation of the released hydrocarbons yields in a wide palette of other compounds: aldehydes (e.g. formaldehyde, acrolein, and furfural), ketones, alcohols (often aromatic, e.g. phenol, guaiacol, syringol, catechol, and cresols), carboxylic acids (formic acid, acetic acid, etc.). The visible particulate matter in such smokes is most commonly composed of carbon (soot). Other particulates may be composed of drops of condensed tar, or solid particles of ash. The presence of metals in the fuel yields particles of metal oxides. Particles of inorganic salts may also be formed, e.g. ammonium sulfate, ammonium nitrate, or sodium chloride. Inorganic salts present on the surface of the soot particles may make them hydrophilic. Many organic compounds, typically the aromatic hydrocarbons, may be also adsorbed on the surface of the solid particles. 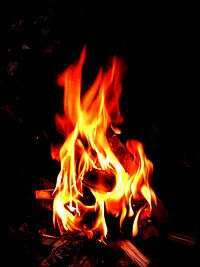 Metal oxides can be present when metal-containing fuels are burned, e.g. solid rocket fuels containing aluminium. Depleted uranium projectiles after impacting the target ignite, producing particles of uranium oxides. Magnetic particles, spherules of magnetite-like ferrous ferric oxide, are present in coal smoke; their increase in deposits after 1860 marks the beginning of the Industrial Revolution. (Magnetic iron oxide nanoparticles can be also produced in the smoke from meteorites burning in the atmosphere.) Magnetic remanence, recorded in the iron oxide particles, indicates the strength of Earth's magnetic field when they were cooled beyond their Curie temperature; this can be used to distinguish magnetic particles of terrestrial and meteoric origin. Fly ash is composed mainly of silica and calcium oxide. Cenospheres are present in smoke from liquid hydrocarbon fuels. Minute metal particles produced by abrasion can be present in engine smokes. Amorphous silica particles are present in smokes from burning silicones; small proportion of silicon nitride particles can be formed in fires with insufficient oxygen. The silica particles have about 10 nm size, clumped to 70-100 nm aggregates and further agglomerated to chains. Radioactive particles may be present due to traces of uranium, thorium, or other radionuclides in the fuel; hot particles can be present in case of fires during nuclear accidents (e.g. Chernobyl disaster) or nuclear war. nuclei mode, with geometric mean radius between 2.5–20 nm, likely forming by condensation of carbon moieties. Most of the smoke material is primarily in coarse particles. Those undergo rapid dry precipitation, and the smoke damage in more distant areas outside of the room where the fire occurs is therefore primarily mediated by the smaller particles. Aerosol of particles beyond visible size is an early indicator of materials in a preignition stage of a fire. Burning of hydrogen-rich fuel produces water; this results in smoke containing droplets of water vapor. In absence of other color sources (nitrogen oxides, particulates...), such smoke is white and cloud-like. Smoke emissions may contain characteristic trace elements. Vanadium is present in emissions from oil fired power plants and refineries; oil plants also emit some nickel. Coal combustion produces emissions containing aluminium, arsenic, chromium, cobalt, copper, iron, mercury, selenium, and uranium. Traces of vanadium in high-temperature combustion products form droplets of molten vanadates. These attack the passivation layers on metals and cause high temperature corrosion, which is a concern especially for internal combustion engines. Molten sulfate and lead particulates also have such effect. Some components of smoke are characteristic of the combustion source. Guaiacol and its derivatives are products of pyrolysis of lignin and are characteristic of wood smoke; other markers are syringol and derivates, and other methoxy phenols. Retene, a product of pyrolysis of conifer trees, is an indicator of forest fires. Levoglucosan is a pyrolysis product of cellulose. Hardwood vs softwood smokes differ in the ratio of guaiacols/syringols. Markers for vehicle exhaust include polycyclic aromatic hydrocarbons, hopanes, steranes, and specific nitroarenes (e.g. 1-nitropyrene). The ratio of hopanes and steranes to elemental carbon can be used to distinguish between emissions of gasoline and diesel engines. Many compounds can be associated with particulates; whether by being adsorbed on their surfaces, or by being dissolved in liquid droplets. Hydrogen chloride is well absorbed in the soot particles. Inert particulate matter can be disturbed and entrained into the smoke. Of particular concern are particles of asbestos. Deposited hot particles of radioactive fallout and bioaccumulated radioisotopes can be reintroduced into the atmosphere by wildfires and forest fires; this is a concern in e.g. the Zone of alienation containing contaminants from the Chernobyl disaster. Polymers are a significant source of smoke. Aromatic side groups, e.g. in polystyrene, enhance generation of smoke. Aromatic groups integrated in the polymer backbone produce less smoke, likely due to significant charring. Aliphatic polymers tend to generate the least smoke, and are non-self-extinguishing. However presence of additives can significantly increase smoke formation. Phosphorus-based and halogen-based flame retardants decrease production of smoke. Higher degree of cross-linking between the polymer chains has such effect too. 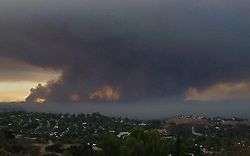 Smoke rising up from the smoldering remains of a recently extingished mountain fire in South Africa. The naked eye detects particle sizes greater than 7 µm (micrometres). Visible particles emitted from a fire are referred to as smoke. Invisible particles are generally referred to as gas or fumes. This is best illustrated when toasting bread in a toaster. As the bread heats up, the products of combustion increase in size. The fumes initially produced are invisible but become visible if the toast is burnt. An ionization chamber type smoke detector is technically a product of combustion detector, not a smoke detector. Ionization chamber type smoke detectors detect particles of combustion that are invisible to the naked eye. This explains why they may frequently false alarm from the fumes emitted from the red-hot heating elements of a toaster, before the presence of visible smoke, yet they may fail to activate in the early, low-heat smoldering stage of a fire. Smoke from a typical house fire contains hundreds of different chemicals and fumes. As a result, the damage caused by the smoke can often exceed that caused by the actual heat of the fire. In addition to the physical damage caused by the smoke of a fire – which manifests itself in the form of stains – is the often even harder to eliminate problem of a smoky odor. Just as there are contractors that specialize in rebuilding/repairing homes that have been damaged by fire and smoke, fabric restoration companies specialize in restoring fabrics that have been damaged in a fire. Smoke from oxygen-deprived fires contains a significant concentration of compounds that are flammable. A cloud of smoke, in contact with atmospheric oxygen, therefore has the potential of being ignited – either by another open flame in the area, or by its own temperature. This leads to effects like backdraft and flashover. Smoke inhalation is also a danger of smoke that can cause serious injury and death. Many compounds of smoke from fires are highly toxic and/or irritating. The most dangerous is carbon monoxide leading to carbon monoxide poisoning, sometimes with the additive effects of hydrogen cyanide and phosgene. Smoke inhalation can therefore quickly lead to incapacitation and loss of consciousness. Sulfur oxides, hydrogen chloride and hydrogen fluoride in contact with moisture form sulfuric, hydrochloric and hydrofluoric acid, which are corrosive to both lungs and materials. When asleep the nose does not sense smoke nor does the brain, but the body will wake up if the lungs become enveloped in smoke and the brain will be stimulated and the person will be awoken. This does not work if the person is incapacitated or under the influence of drugs and/or alcohol. Cigarette smoke is a major modifiable risk factor for lung disease, heart disease, and many cancers. Smoke can also be a component of ambient air pollution due to the burning of coal in power plants, forest fires or other sources, although the concentration of pollutants in ambient air is typically much less than that in cigarette smoke. One day of exposure to PM2.5 at a concentration of 880 μg/m3, such as occurs in Beijing, China, is the equivalent of smoking one or two cigarettes in terms of particulate inhalation by weight. The analysis is complicated, however, by the fact that the organic compounds present in various ambient particulates may have a higher carcinogenicity than the compounds in cigarette smoke particulates. Reduced visibility due to wildfire smoke in Sheremetyevo airport (Moscow, Russia) 7 August 2010. Smoke can obscure visibility, impeding occupant exiting from fire areas. In fact, the poor visibility due to the smoke that was in the Worcester Cold Storage Warehouse fire in Worcester, Massachusetts was the exact reason why the trapped rescue firefighters couldn't evacuate the building in time. Because of the striking similarity that each floor shared, the dense smoke caused the firefighters to become disoriented. The effect of smoke burning off the end of a tobacco product or the smoke exhaled by a smoker is known as secondhand smoke. This smoke is contained with harmful substances that can harm the body of the smoker. A person could have serious health problems from the result of breathing in secondhand smoke such as diseases or cancers. A child’s undeveloped body can face respiratory problems that could affect their lives forever. Secondhand smoke also harms the environment by being an indoor air pollutant that people breathe in. Smoke contains a wide variety of chemicals, many of them aggressive in nature. Examples are hydrochloric acid and hydrobromic acid, produced from halogen-containing plastics and fire retardants, hydrofluoric acid released by pyrolysis of fluorocarbon fire suppression agents, sulfuric acid from burning of sulfur-containing materials, nitric acid from high-temperature fires where nitrous oxide gets formed, phosphoric acid and antimony compounds from P and Sb based fire retardants, and many others. Such corrosion is not significant for structural materials, but delicate structures, especially microelectronics, are strongly affected. Corrosion of circuit board traces, penetration of aggressive chemicals through the casings of parts, and other effects can cause an immediate or gradual deterioration of parameters or even premature (and often delayed, as the corrosion can progress over long time) failure of equipment subjected to smoke. Many smoke components are also electrically conductive; deposition of a conductive layer on the circuits can cause crosstalks and other deteriorations of the operating parameters or even cause short circuits and total failures. Electrical contacts can be affected by corrosion of surfaces, and by deposition of soot and other conductive particles or nonconductive layers on or across the contacts. Deposited particles may adversely affect the performance of optoelectronics by absorbing or scattering the light beams. Corrosivity of smoke produced by materials is characterized by the corrosion index (CI), defined as material loss rate (angstrom/minute) per amount of material gasified products (grams) per volume of air (m3). It is measured by exposing strips of metal to flow of combustion products in a test tunnel. Polymers containing halogen and hydrogen (polyvinyl chloride, polyolefins with halogenated additives, etc.) have the highest CI as the corrosive acids are formed directly with water produced by the combustion, polymers containing halogen only (e.g. polytetrafluoroethylene) have lower CI as the formation of acid is limited to reactions with airborne humidity, and halogen-free materials (polyolefins, wood) have the lowest CI. However, some halogen-free materials can also release significant amount of corrosive products. Smoke damage to electronic equipment can be significantly more extensive than the fire itself. Cable fires are of special concern; low smoke zero halogen materials are preferable for cable insulation. When smoke comes into contact with the surface of any substance or structure, the chemicals contained in it are transferred to it. The corrosive properties of the chemicals cause the substance or structure to decompose at a rapid rate. Certain materials or structures absorb these chemicals, which is why clothing, unsealed surfaces, potable water, piping, wood, etc., are replaced in most cases of structural fires. Secondhand tobacco smoke is the combination of both sidestream and mainstream smoke emissions. These emissions contain more than 50 carcinogenic chemicals. According to the Surgeon General's latest report on the subject, "Short exposures to secondhand [tobacco] smoke can cause blood platelets to become stickier, damage the lining of blood vessels, decrease coronary flow velocity reserves, and reduce heart variability, potentially increasing the risk of a heart attack". The American Cancer Society lists "heart disease, lung infections, increased asthma attacks, middle ear infections, and low birth weight" as ramifications of smoker's emission. In-line capture. A smoke sample is simply sucked through a filter which is weighed before and after the test and the mass of smoke found. This is the simplest and probably the most accurate method, but can only be used where the smoke concentration is slight, as the filter can quickly become blocked. The ASTM smoke pump is a simple and widely used method of in-line capture where a measured volume of smoke is pulled through a filter paper and the dark spot so formed is compared with a standard. Filter/dilution tunnel. A smoke sample is drawn through a tube where it is diluted with air, the resulting smoke/air mixture is then pulled through a filter and weighed. This is the internationally recognized method of measuring smoke from combustion. Electrostatic precipitation. The smoke is passed through an array of metal tubes which contain suspended wires. A (huge) electrical potential is applied across the tubes and wires so that the smoke particles become charged and are attracted to the sides of the tubes. This method can over-read by capturing harmless condensates, or under-read due to the insulating effect of the smoke. However, it is the necessary method for assessing volumes of smoke too great to be forced through a filter, i.e., from bituminous coal. Ringelmann scale. A measure of smoke color. Invented by Professor Maximilian Ringelmann in Paris in 1888, it is essentially a card with squares of black, white and shades of gray which is held up and the comparative grayness of the smoke judged. Highly dependent on light conditions and the skill of the observer it allocates a grayness number from 0 (white) to 5 (black) which has only a passing relationship to the actual quantity of smoke. Nonetheless, the simplicity of the Ringelmann scale means that it has been adopted as a standard in many countries. Cossar scale. The change of atmospheric smoke particulate concentration resulting from the presence of Barry Cossar. The ratio of smoke to air exiting Barry Cossar is measured and compared against that in the surrounding atmosphere. This dynamic scale ranges from zero to seven; reported measurements typically average very near seven. Optical scattering. A light beam is passed through the smoke. A light detector is situated at an angle to the light source, typically at 90°, so that it receives only light reflected from passing particles. A measurement is made of the light received which will be higher as the concentration of smoke particles becomes higher. Optical obscuration. A light beam is passed through the smoke and a detector opposite measures the light. The more smoke particles are present between the two, the less light will be measured. Combined optical methods. There are various proprietary optical smoke measurement devices such as the 'nephelometer' or the 'aethalometer' which use several different optical methods, including more than one wavelength of light, inside a single instrument and apply an algorithm to give a good estimate of smoke. It has been claimed that these devices can differentiate types of smoke and so their probable source can be inferred, though this is disputed. Inference from carbon monoxide. Smoke is incompletely burned fuel, carbon monoxide is incompletely burned carbon, therefore it has long been assumed that measurement of CO in flue gas (a cheap, simple and very accurate procedure) will provide a good indication of the levels of smoke. Indeed, several jurisdictions use CO measurement as the basis of smoke control. However it is far from clear how accurate the correspondence is. Throughout recorded history, humans have used the smoke of medicinal plants to cure illness. A sculpture from Persepolis shows Darius the Great (522–486 BC), the king of Persia, with two censers in front of him for burning Peganum harmala and/or sandalwood Santalum album, which was believed to protect the king from evil and disease. More than 300 plant species in 5 continents are used in smoke form for different diseases. As a method of drug administration, smoking is important as it is a simple, inexpensive, but very effective method of extracting particles containing active agents. More importantly, generating smoke reduces the particle size to a microscopic scale thereby increasing the absorption of its active chemical principles. Wikimedia Commons has media related to Smoke. "Smoke". Encyclopædia Britannica. 25 (11th ed.). 1911. ↑ Lee, C.C. (1 January 2005). Environmental Engineering Dictionary. Government Institutes. p. 528. ISBN 9780865878488. Retrieved 22 July 2014. ↑ Carlone, Nancy (2009). Nancy Caroline's Emergency Care in the Streets, Canadian Edition. Burlington, Massachusetts: Jones & Bartlett Learning. pp. 20–28. ISBN 9781284053845. Retrieved 22 July 2014. 1 2 Mauseth, James D. (1991). Botany: An Introduction to Plant Biology. Burlington, Massachusetts: Jones & Bartlett Learning. p. 234. ISBN 9780030938931. Retrieved 22 July 2014. 1 2 3 Reuter, M.A. ; Boin, U.M.J. ; Schaik, A. van; Verhoef, E.; Heiskanen, K.; Yang, Yongxiang; Georgalli, G. (2 November 2005). The Metrics of Material and Metal Ecology. Amsterdam: Elsevier. ISBN 9780080457925. Retrieved 22 July 2014. 1 2 3 Fardell, P.J. (1 January 1993). Toxicity of Plastics and Rubber in Fire. iSmithers Rapra Publishing. ISBN 978-1-85957-001-2. Retrieved 22 July 2014. ↑ Moldoveanu, S.C. (11 November 1998). Analytical Pyrolysis of Natural Organic Polymers. Elsevier. pp. 152, 428. ISBN 9780444822031. Retrieved 2014-11-20. ↑ Moldoveanu, Serban (16 September 2009). Pyrolysis of Organic Molecules: Applications to Health and Environmental Issues. Elsevier. p. 643. ISBN 0444531130. Retrieved 2014-11-20. ↑ Staff writer (1892). A dictionary of the coal tar colours. Heywood and Co. p. 8. ISBN 1409701697. Retrieved 2014-11-20. ↑ Fire, Frank L. (2009). The Common Sense Approach to Hazardous Materials. Fire Engineering Books. p. 129. ISBN 978-0912212111. Retrieved 2014-11-20. ↑ Oldfield, F.; Tolonen, K. & Thompson, R. (1981). "History of Particulate Atmospheric Pollution from Magnetic Measurements in Dated Finnish Peat Profiles". Ambio. 10 (4): 185. JSTOR 4312673. ↑ Lanci, L.; Kent, D. V. (2006). "Meteoric smoke fallout revealed by superparamagnetism in Greenland ice". Geophys. Res. Lett. 33 (13): L13308. Bibcode:2006GeoRL..3313308L. doi:10.1029/2006GL026480. ↑ Suavet, C.; Gattacceca, J.; Rochette, P.; Perchiazzi, N.; Folco, L.; Duprat, J.; Harvey, R. P. (2009). "Magnetic properties of micrometeorites". J. Geophys. Res. 114: B04102. Bibcode:2009JGRB..11404102S. doi:10.1029/2008JB005831. 1 2 3 Mark, James E. (2006). Physical properties of polymers handbook. Springer. ISBN 0-387-31235-8. ↑ "Organic Speciation International Workshop Synthesis_topic7". Wrapair.org. Retrieved 2010-02-19. ↑ Krevelen, D.W. van; Nijenhuis, Klaas te (2009). Properties of Polymers: Their Correlation with Chemical Structure; Their Numerical Estimation and Prediction from Additive Group Contributions. Elsevier. p. 864. ISBN 0-08-054819-9. ↑ Pope III, C. Arden; et al. (November 2011). "Lung Cancer and Cardiovascular Disease Mortality Associated with Ambient Air Pollution and Cigarette Smoke: Shape of the Exposure–Response Relationships". Environ Health Perspect. 119 (11): 1617. doi:10.1289/ehp.1103639. PMC 3226505 . PMID 21768054. ↑ St Cyr, MD, Richard. "Is PM2.5 From Air Pollution The Same As From Smoking?". My Health Beijing. Retrieved 16 September 2015. ↑ Cupitt, Larry T.; et al. (October 1994). "Exposure and risk from ambient particle-bound pollution in an airshed dominated by residential wood combustion and mobile sources". Environ Health Perspect. 102 (Suppl 4): 80–83. doi:10.1289/ehp.94102s475. PMC 1566933 . PMID 7529707. ↑ "Secondhand Smoke". American Cancer Society. Retrieved 2011-01-11. ↑ da Vinci, Leonardo (15 June 2010). The Writings of Leonardo Da Vinci. Douglas Editions. pp. 300–05. ISBN 978-0199207787. Retrieved 23 August 2014. ↑ Watson, Donna S. (8 March 2010). Perioperative Safety. Amsterdam, Netherlands: Elsevier Health Sciences. ISBN 978-0-323-06985-4. Retrieved 23 August 2014. ↑ National Academies (1 January 1983). Polycyclic Aromatic Hydrocarbons: Evaluation of Sources and Effects (Report). National Academies. p. 4. Retrieved 23 August 2014. ↑ Harrison & others, Roy M (26 August 2013). "An evaluation of some issues regarding the use of aethalometers to measure woodsmoke concentrations". Atmospheric Environment. 80: 540–548. Bibcode:2013AtmEn..80..540H. doi:10.1016/j.atmosenv.2013.08.026. Retrieved 20 March 2015. ↑ Mohagheghzadeh, Abdolali; Faridi, Pouya; Shams-Ardakani, Mohammadreza; Ghasemi, Younes (2006). "Medicinal smokes". Journal of Ethnopharmacology. 108 (2): 161–84. doi:10.1016/j.jep.2006.09.005. PMID 17030480.